Private home in the small mountain town of Gardiner, Montana on the north border of Yellowstone National Park. Why stay in a hotel room when you can have the comfort of home! Our goal is your comfort, relaxation and enjoyment! Elk River Lodge at Yellowstone is a comfortable, relaxing home at the Original Historic Entrance to Yellowstone. A good start for the next days' adventures in Yellowstone and the beautiful, mountains and waterways surrounding the area! The home is brand new as of 2009. During the winter, an excellent home base for "wolf watching," inspiring Yellowstone Association wildlife & wilderness classes & tours, adventure with cross-country skiing & snowmobiling in Yellowstone. Special rates available for extended stays (2 weeks or longer). 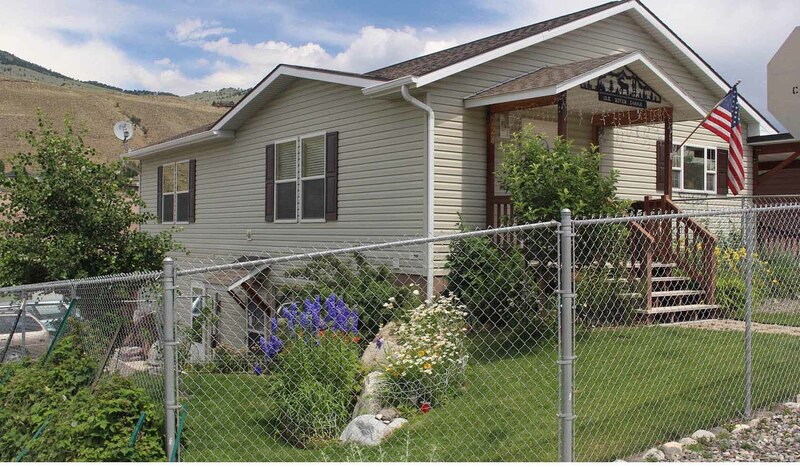 We are very conveniently located in the town of Gardiner, Montana, right on the border of Yellowstone Park! The Elk River Lodge is comfortable with a fully equipped kitchen as well as a patio BBQ grill. If more relaxation is in mind, there are restaurants, deli's and grills conveniently available within a short walk of the house. Please see our reviews and let our guests speak for themselves. If you arrive from the North, you will have an exquisitely beautiful drive either through Paradise Valley (Hwy 89 S), or the Beartooth Mountains (please schedule extra time for the Beartooth Pass). Elk River Lodge is located in the "cowboy" town of Gardiner, Montana. Galleries, Park's Fly Fishing, Camping goods, Gift shops are all within walking distance. When you are in the "wilderness," this is important, since the nearest "city" is a 103 mile round-trip away. Guides and outfitters are available for adventures in fishing, horseback riding and whitewater rafting! World Class fishing streams are located within 1-mile of the home, plus more in the interior of Yellowstone. For your comfort and convenience, the Elk River Lodge is equipped with central air conditioning, satellite television, Wi-Fi, all linens and paper goods, kitchen appliances, utensils & dishware. The home is kid-friendly and furnished with games and books.